This page describes and has links to my program, ADPCM, to play sound clips from the .mth sound file. I am releasing this program and documentation under the GNU GENERAL PUBLIC LICENSE Version 3 and GNU Free Documentation License Version 1.3. These licenses permit anyone to use the program and the documentation to produce follow on programs as long as those programs remain covered by the GNU licenses. The ".mth" sound file contains engine information and sounds. I looked at the sounds, and later, the softkey information only. After banging my head on it for a few days off and on, I managed to figure out the audio directory structure. Starting at 0x0100 there is a series of 16 byte records running up through 0x10E0. I don't have all the fields nailed down yet, but audio sample location and length seems to be spot on. Everything is referenced by frames (16bit) and sample offset count. I've tried this with a few PS2 and PS3 files and they all seem to map correctly. The following is an example of the first 3 records for a PS2 sd70ace file I pulled (R092PF3SD70ACe_ALL100107aF2X.MTH) that should explain it a little better. There's more data further in the header section I haven't worked on yet, but I'm now able to pull all discrete audio from the file. I'm a ways off from modifying or porting soundsets, but it definitely seems doable. Frames are 16bit (65,536 byte frame size). Audio is referenced as Frame number + offset in sample count. Audio samples are 4bit ADPCM (i.e. 512 bytes = 1024 samples). All calculated offsets for audio records are in reference to the beginning of the audio data which is at 0x8000 in the .mth file. 0x0109: 00 00 00 // majority of records defined this way. when not, pattern is apperent but haven't analyzed it yet. 0x010F: 0B // not known yet. seems to be a bitmask or referenced in nibbles. probably sample rate and other flags. Found some more tidbits last week when exploring newer PS3 files. Found some audio that wasn't ADPCM! Took some digging and bit fiddling, but ended up 24bit PCM in big endian. So it seems that page and offset references are by nibble count, not necessarily sample rate. Not sure why the 4bit references yet, but it seems to hold true. I threw together a little C# app and am able to extract all the raw audio data into separate files as well as play the 24bit PCM within the app. Once I get the ADPCM decoding and playing within the app I'll post something for people to play with. Been looking for checksum data, but haven't located it yet. Nothing in the upper header anyways. Still more stuff to parse between the directory structure and audio data. I tried to contact him but could not. So I took what he found as a basis and created this program to play clips from the sound file. First the program looks at the index and creates a table showing each clip and the playback information about each clip. You can then select a clip and play it. The program will play both 4 bit ADPCM and 24 bit signed PCM clips. 4 bit ADPCM is "Adaptive Differential Pulse-Code Modulation". You can Google that! Its an industry standard method of encoding sound developed in the 1970's at Bell Labs. Originally used on telephone systems with a sample rate of 8,000 Hz. It was adopted by the Interactive Multimedia Association in the early 1990's (called IMA/DVI ADPCM). It's a compressed format and I used a decompresser written by David Overton. Since it uses only 4 bits to represent each sample, it is a lossy encoding. It is NOT VOX ADPCM. This is imporant when you create clips to insert into the sound file. 24 bit signed PCM uses 24 bits to represent each Sample. It is not a compressed format and uses 24 bits to represent each sample. It's Big-Endian! (Google that!) This is important when you create clips to insert into the sound file. Thus the sound file size is six times larger than 4 bit ADPCM. The result is a much higher quality sound. Index - the index consists of 255-16 byte entries. Start - the offset into the sound file of the start of this clip. End - the offset into the sound file of the end of this clip. bit 6 - possibly, with bits 7 & 3, sets the sample rate and format per the table below. bit 3 - possibly, with bits 7 & 6, sets the sample rate and format per the table below. bits 1-0 - unknown, either "00" or "11", but mostly "11". When the ADPCM program has "[X] Automatic Settings" checked, it uses this table to take its best guess at the settings for clip format and sample rate. Start Rep - the offset into the sound file of the start of a repeatable segment of a clip. End Rep - the offiset into the sound file of the end of a repeatable segment of a clip. SM Init- For IMA/DVI ADPCM clips this is "State machine initialization" - for the programers out there : the ADPCM decompressor is written as a state machine. The decompressor state machine requires two pieces of data at startup - the initial state and previous sound value. When you start a clip from the beginning, both of these values are usually zero. A repeating segment, which may start in the middle of a clip, needs to know these two pieces of data to produce the correct sound. You can look at the code if you are really interested. For 24 bit signed PCM clips, I don't know what this field in the index used for because it does sometimes contain a non-zero value. The sound file from the beginning of the file (0x0000) to the start of the index (0x0100) and from the end of the index (0x10FF) to the first sound clip (0x8000) probably contains engine performance information. The softkeys are stored at 0x1900-0x191F. The [Edit Softkeys] button lets you turn these softkeys on and off. I don't know anything about the engine performance information. You can download the latest version of ADPCM from links below. Make a folder, maybe called ADPCM. Unzip the contents of the zip file into that folder. Start the program by double clicking on "ADPCM.exe". In Windows Explorer, it may appear as "ADPCM Application". Press [Browse] to choose a sound file. ADPCM can play back most of the clips for both PS2 and PS3 engines. You can select either ".mth" files or ".ima" files or ".raw" files. ".ima" files are 4 bit IMA/DVI ADPCM audio data. The ".raw" files are for 24 bit big endian signed PCM audio data. The clip's data format can either be 4 bit IMA ADPCM (PS2 and PS3 engines) or 24 bit big endian signed PCM (PS3 engines). For ".ima" or ".raw" files, you can play the entire file by clicking on [Play Entire File]. For ".mth" files, press [Analyze] and the program will list each clip in the index. This is for ".mth" files only. ".ima" and ".raw" files can only played directly with the [Play Entire File] button. If the file is a ".mth" file, the program can play each clip in the index. Click in the index for the clip you want to play. Choose the file Level, the Sample Rate and the Clip Format (or skip this and let the program take its best quess by checking [X] Automatic Settings). Press [Play Clip] --- the program converts the sound to 16 bit PCM and sends it to the default sound card. It's Mono. When you play the horn/whistle sound, at clip 152, ADPCM will always play ending clip 153. I did this to make the horn/whistle sound right when played. If you play clip 152 with the [Long Play] button, ADPCM will randomly choose from ending clips 154, 155 and 156. Watch the Messages window and you can see which ending that ADPCM randomly selected. In the engine, clip 153 is the simple normal end of a horn/whistle. Clips 154-156 are more fanciful endings. When you replace the horn/whistle clip, you should always replace all 5 (152-156) at the same time so the horn/whistle sounds right. If the clip has a repeatable section, you can press the [Play Repeating Segment] button. The program will play that segment once. You can press [Stop] to try to stop playback but the code queues up 20 blocks in advance. It may take 10-20 seconds to actually stop playing a long clip. Volume control is a real Windows volume control. Values go from 0 to 15. "[X] Automatic Setting" lets the program make its best guess at the file Level, the Sample Rate and the Clip Format of the clip. If you can figure out how I can improve the guesses, let me know. You should normally run with this box checked. The program has actually gotten pretty good at this guess. You can always override the program by picking Level/Format/Rate explicitly using the radio buttons. It defaults to [X] checked. If you press the [Long Play] button, which is enabled if a "Repeating Segment" is present, ADPCM will play the clip while repeating the segment the number of times shown in the "Rep" field. This technique is used, for example, for the bell sound. Setting "Rep" to a higher number will cause the bell to ding additional times. If you click on the title of the left column of the grid, "Clip # /Offset", the value in that column will change from the hex offset into the sound file to a numeric counting of sounds. The numeric value of each sound corresponds to the number sent in the "n" command to the TIU by the RTC program. The sound Filename, file Level, the Sample Rate, the Clip Format, Automatic Setting status, and Volume are saved in the Registry for the next time you run the program. [GetDevCaps] button shows the result of the call to the windows function of the same name. Useful only if you work with the source code. Hint - If you click on "ADPCM Info" from a popup menu and then click on the [Hide] button, that annoying copyright window on startup won't appear any more. You can get (almost) all of the sound files from MTH's web pages. click on icon that says "ProtoSound"
This will let you download either the sound file which is named "*.mth" or it will let you download a ZIP file which contains the sound file. Just open the "*.mth" sound file with the ADPCM program (press [Browse] or drag & drop). export one clip by clicking on [Export mp3] after you have analyzed a sound file. export all clips by selecting "Export all clips to mp3" from any popup menu. The program will go through all of the sounds in the index and create individual sound files in the same folder as the ".mth" file. In both cases, each sound file is named with the ".mth" filename followed by the index number of clip, 1-255, and the extension mp3. This requires the "lame" mp3 encoder. You can get version 3.99.5 for Windows here. Its a zip file. The program "lame.exe" and the DLL "lame_enc.dll" must be placed into the same folder as holds the ADPCM.exe file. You can use the complementary copy of lame v3.99.5 in the ADPCM zip file that you download from this web page. MP3 format does not support the 5512 Hz sample rate which is common in the sound files. Lame upsamples them to 8000 Hz when creating the mp3 file. Other sample rates are used unchanged. Version 1.1.2 of ADPCM ADPCM will allow you to replace a clip in a sound file with a clip from another sound file. Start with a sound file downloaded from the engine's web page as I describe in "Getting Sound Files" above. Make a copy of it and work with the copy. Run ADPCM and [Browse] or Drag & Drop the sound file into the Filename entry box. Press the [Analyze] button. Note the value for "End of Sounds" which displays in the "Messages" box. More about this later. Scroll down the index table to the clip that you want to change. Click on that row in the index. Then right click on the row and select "Edit Clip" or just press the [Edit Clip] button. Click on "(o) Replace clip with a clip from another sound file". Press [Browse] or Drag & Drop the sound file that you will be taking the clip from. Type the Clip Number of the clip in that sound file. When the clip transfer is complete, the sound file index will update and you can look at and test the result of the clip change. The sound file can be transfered to the engine using the DCS Loader. 1. If you replace a short clip with a longer clip (look at the Length field of the clips), the sound file will grow. ADPCM will alert you if the clip that you are adding causes the sound file to grow larger than the engine's EEPROM. You should always double check the calculation. If you replace a clip with a shorter clip, the unused space is recoved and is available for other clips. 2. With a few exceptions, clips seem to be randomly located in the index depending on the engine. If you put a clip into a previously empty clip number, the engine will probably not know what to do with it. ADPCM will let you put a clip with a repeating segment into a clip location that did not have a repeating segment, but the engine probabaly won't know what to do with the repeating segment information. 177-186 Engine Sounds clips which correspond to S01-S10 on the softkeys. 4. Do not put a 24 bit PCM clip into a PS2 sound file. As far as I know, PS2 engines cannot play 24 bit PCM sound clips. PS3 engines can play both types of sound clips. 5. I've tried this with a few engines and it seems to work. If any changed clips don't play correctly, you can always just reload the original sound file back into the engine. That said, I am not responsible for anything that happens to your engines as a result of using ADPCM. I use version 5.0 of the DCS Loader. I'd appreciate hearing any insights you have about other clips and how they are used. Version 1.1.5 of ADPCM allows you to replace a clip in the sound file with any other sound. 1. Allows you to insert any sound from a disk file into the sound file. ADPCM will let you insert any 4 bit IMA-ADPCM or 24 bit big-endian signed PCM sound clip into the sound file. You must be careful about the the new size of the sound file so you don't exceed the EEPROM size. The program will try to warn you if you exceed the EEPROM size but the program can only guess at the size and it may be wrong. The best candidates for replacement are the Engine Sounds S01 to S10. Most engines play many of these sounds from the softkeys. They correspond to index locations 177 to 186. They do not repeat. You must convert the sound you want to insert into a 4 bit IMA-ADPCM or a 24 bit signed big-endian PCM file. I used Audacity and sox for this. 1. Once your clip (maybe from an mp3 file or recorded from your microphone) is in Audacity, make sure the sample rate is set to 5512 Hz, 11025Hz or 22050 Hz. If its not, resample it. The sound level setting will affect how the sound plays in the engine. I can't give you any guidance about this. You will have to experiment. Remember that the sample rates are samples per second of sound. One second of 11025 Hz sound using 24 bit signed PCM is 33,075 bytes. The sound file will fill up FAST. At 4 bit ADPCM at 11025 Hz, it's only 5,512 bytes (but at lower audio quality). 3. Set "Save as type" to "Other Uncompressed files"
4. Set "Header" to "RAW (header-less)"
signed little endian PCM clip. Press [Save], press [OK] on the metadata screen without entering anything. Note: Audacity only generates little-endian signed 24 bit PCM *.raw files. See step 8. "C:\Program Files (x86)\sox-14-4-2\sox" "Bells_x4_4bADPCM_11025Hz.vox" -e ima-adpcm -c 1 "Bells_x4_4bADPCM_11025Hz.ima"
Echo You did not enter the input file name. So happy to have found this thread - and really appreciate the work done to decipher the MTH sound files and assemble a program to manipulate the sounds inside. I have a PS2 steamer pulling my Polar Express around our Christmas village. Not only were the sounds not really appropriate for the Polar Express, but the command environment made it so the conductor announcement car was not functional. This is no longer an issue! "C:\Program Files (x86)\sox-14-4-2\sox.exe" -t wav - -e ima-adpcm -c 1 "%f"
allowing Audacity to pipe its wav output directly into sox, skipping the intermediate vox step. 8. For 24 bit signed PCM clips, convert the .raw file from little-endian to big-endian. Audacity only outputs raw files as little-endian. Sound files require 24 bit signed PCM clips to be big-endian. Maybe the sound editing program that you use can output directly as big-endian so you would not need to do this. I use sox to do the conversion. Random aside: Apple computers are typically big-endian, Intel based computers (ie Windows) are little-endian. Guess which type of computers that MTH uses for developing sound files! If you don't know about Little Indians and Big Indians, you can google "byte ordering" or click here: Endianness. "C:\Program Files (x86)\sox-14-4-2\sox" -t .s24 -c 1 -r 11025 -B "Bells_x4_le_24bPCM_11025Hz.raw" "Bells_x4_le_24bPCM_11025Hz.raw"
The program zip file contains a batch script name le_to_be.bat to help you with this conversion. 10. Select the clip to be replaced. 11. Right click for the popup menu and select "Edit Clip" or just push the [Edit Clip] button. 12. Set "Operation" to "(o) Replace clip with a clip read from a file"
13. [Browse] or Drag & Drop the new sound clip into the Filename field. This is more difficult because I don't have a sure-fire algorithm that will always work for this choice. 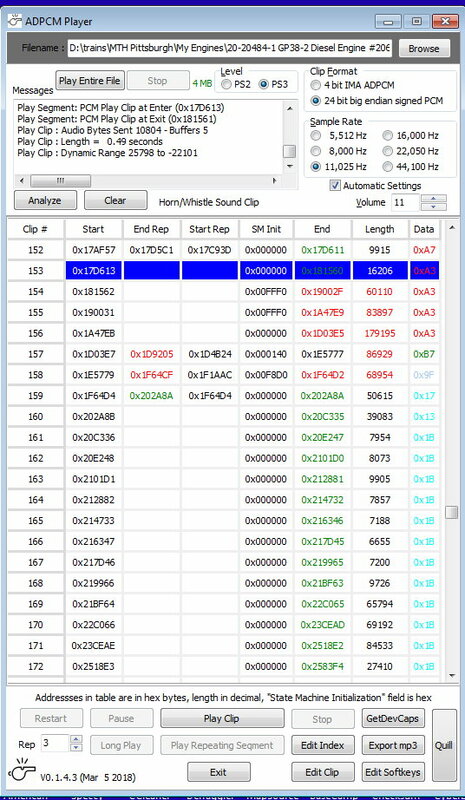 The initial value is the data byte from the original clip in the sound file. The value of this data byte sets the Clip Format, Sample Rate, and Category of the sound in the engine. Get it wrong and funny sounds will come out of the speaker. My best suggestion is to create the replacement clip in the exact same format as the clip to be replaced and use the value of the data byte from the original clip. This is not required, though. I have replaced clips with clips using a different data byte. You can also search through the original sound file, looking at other clips, until you find one that matches your new clip, then use the data byte value from that clip. 15. Press [DoIt] and the new clip replaces the original clip in the sound file. 16. If the clip has a repeating segment, look at the next section titled "Editing an index entry". 2. 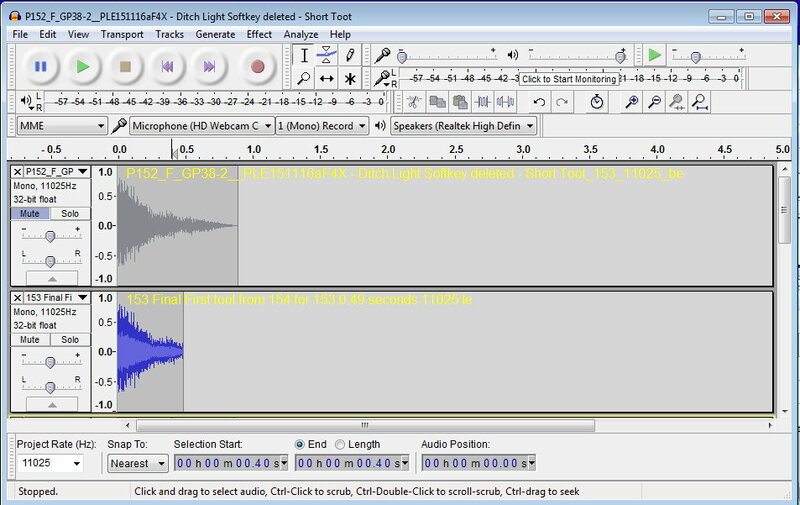 ADPCM adjusts the length of the sound file to be correct whenever it is edited. This will insure that only the minimum of data needs to be downloaded to the engine by the DCS Loader in the case where you delete or shorten a clip. 3. On the index menu, I added a menu item ("Dump this clip to disk") to dump a clip from the sound to a disk file. Its a straight extract and dump. The output file will either be a ".ima" file for 4bit IMA-ADPCM clips or a "*_be.raw" file for 24 bit signed big-endian PCM. 4. On the index menu, I added a menu item to set the file length to the highest clip end address in the index. Useful because when you upload a file from an engine, its length is set to 1MB, 2MB or 4MB. To save time when it's downloaded to an engine, we don't have to download the padding at the end of the file. Version 1.2.0 of ADPCM allows you to edit an index entry. You can change any of the fields in the index. This feature does not do very much validation or checking of what you type in. If you make a mistake, some awful sounds will come out of the speaker. Always work on a copy of the sound file. 2. Select the clip index to be edited. 3. Press the [Edit Index] button. 4. Edit the values as you wish and press the [Ok] button or press [Cancel]. The sound file is updated, analyzed and displayed for you. You can use this feature to add a repeating segment to a clip. The engine probably would not know what to do with a repeating segment of a clip that replaced a clip without one. This lists the SMInit value for this (Start Repeating Address) value. You can then insert this SMInit value into the index. With version 1.3.0 of ADPCM comes the ability to add new sounds to the sound file and hook them up to certain softkeys. I was able to add a Xing Signal Horn/Whistle (SXS) sound to an engine that did not come with such a sound. You can have the remote display the softkey label also. Two new options on the [Edit Clip] window : "(o) Add a clip from another sound file into an empty index location" and "(o) Add a clip read from a file into an empty index location" let you put a new sound into an empty or unused index location. Use the first new option to copy a clip from another sound file and use the second new option to copy an IMA 4 bit ADPCM clip or a 24 bit big-endian PCM clip (also known as raw audio data) into your sound file. I know where in the sound file that these softkeys are encoded. If the right bits are set, the remote will display the softkey name. I started with the sound file for the 20-3163 P&LE 2-8-0 H9 Consolidation (PS2). The whistle on this engine is not to my liking. I took the whistle and bell from the 20-3372 NYC Mohawk 4-8-2 (PS2) and copied them into the H9's sound file. The sounds on both of these engines are 4 bit ADPCM. * I copied test sounds into these 2 locations just to test the progam. I haven't yet decided what "real" sounds I want in these 2 spots in my H9. You can choose whatever sounds you want in these locations. You don't have to have slamming doors or gurgling beer - when you press the CDO/CDC softkeys on the remote, the engine will just play the sound. If you check the boxes you need, ADPCM will set the bits in the sound file that will cause the remote to display those softkeys. You must delete the engine from the remote and then add it back for the new softkeys to appear. Note: this is not working with the SAH softkey. I don't know why yet. SXS No modification needed, this was already supported on the Operations window. SAH If the engine supports SAH, a new button [Alternate Sound] will appear under the horn/whistle button on the RTC Operations window - this will be available with version 3.22.0 of RTC. CDO/CDC No modifications needed, this was already supported on the Sound window. You can use any empty index location for new sounds (as long as you don't exceed the size of the EEPROM in the engine). But you will have to use the RTC program to access that sounds as there is no way to get to them via the remote. This is a perfect use for the Hot Buttons window in RTC. You can have RTC send any 'nXXX' command at the press of a button. So just edit up your sound file and load it into an engine for some new sounds. Be sure to delete the engine from the remote and add it back for the changed softkeys labels to take effect. Version 1.3.1 adds the ability to edit the softkey settings. That is, the bits in the sound file that tell the remote which softkeys to display. Most useful if you plug a light into a prevously unused jack on the PS2/3 board in the engine. You can set the bit and the remote will present you with a softkey. Also useful when there are errors in the original sound file from MTH (there are a few!). For example, one engine I have does not have marker lights but the LMK softkey appears on the remote. With this editing function, you can can remove that softkey. To use this, select a sound file on the main window, press [Analyze] and press [Edit Softkeys]. The program will show you the current status of which bits are set. You can select or deselect softkeys. Press [DoIt] or [Cancel] when complete. Then download the sound file to the engine, delete the engine from the remote and add it back for the change to take effect. The remote seems to have used odd terminalogy for the connectors on the board. They talk about "on Ditch", "on Interior" and "on Mars" to mean three connectors on the board. Then when they say "Mars Light on Ditch" they mean the Mars light plugged into the Ditch connector. You can see each light listed like that on the table on pg 121 of the 5th edition DCS Operators Manual. 1. Added a few more softkeys that can be turned on or off on the "Edit Softkey" window. 2. Added the ability to delete a clip from the sound file. The released memory becomes available to be used by added or replaced clips. From the [Edit Clip] menu, select "(o) Delete clip, clear index location and recover space in the sound file". If you just want to clear the index without deleting the clip, select "Clear this index" from the index popup menu. 3. When you press the [Analyze] button, the progam will display the available time remaining in the sound file for added/replaced clips. The calculation is based on the setting of the Format and Sample Rate radio buttons. If you want the time remaining for a different Format or Sample Rate, press the radio buttons as wanted, right click to get the main ADPCM popup menu and select "Available Time Remaining". 4. Added selections to the index ADPCM popup menu to clear an index location and to copy an index location to another index location. 1. Added the sample rate into the automatically generated filename when "Dump Clip to Disk" menu item is selected. 2. Changed the "Dump Clip to Disk" menu item to have a submenu that lets you dump the entire clip as it originally did or to just dump the repeating segment. NOTE that dumping the repeating segment of a 4bit ADPCM clip may not be useful because the State Machine Initialization has not been taken into account. 4. I found that the "Exporting one clip to mp3" function was used more than "Export All Clips to mp3". The [Export mp3] button on the main window now does the first function. You can access the second function from the index popup menu. 5. If you hold down the shift key when you click on [Export mp3], ADPCM will use the long play method which will export the clip including the number of repeats in the "Rep" field. In the case of the horn/whistle, the export will contain one of the four different horn/whistle endings. 6. Added the option to the Edit Clip window to replace a sound with silence. The program does not just delete the sound but replaces it with 0.01 seconds of silence. If there was a repeating segment, the silent clip will also contain one. I can't be certain that this scheme will always work - send feedback. This was suggested by a member of the OGR Forum. The freed up space in the sound file becomes available for new or replacement sounds. 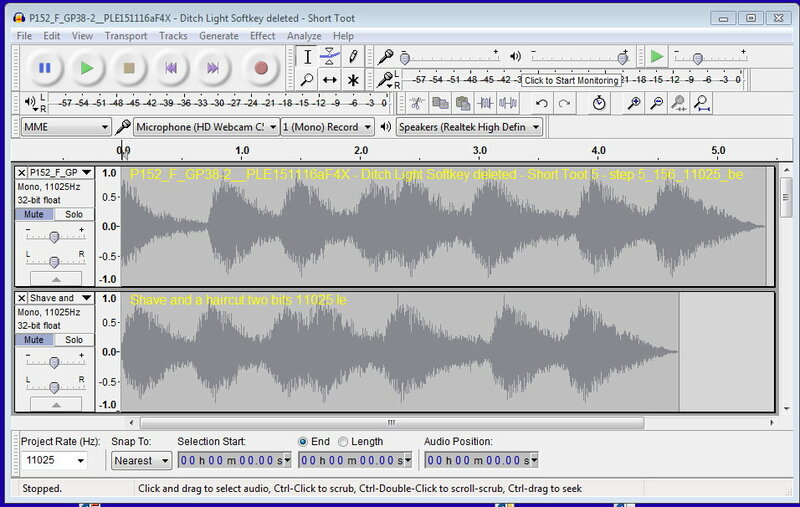 Press [Edit Clip] then select "(o) Replace clip with silence and recover space in sound file". 7. More minor bug fixes. 1. Made "[X] Automatic Settings" default to checked. The program has actually gotten pretty good at this guess. You can always override the program by picking Level/Format/Rate explicitly using the radio buttons. 2. Fixed an incorrect error message when using [Edit Index] to change the data byte from 24 bit PCM to 4 bit ADPCM setting in PS3 sound files that were less than 2MB in size. 3. The Hex Editor code that I used in the [Edit Index] window, written by Jacek Szumigaj <szumi users.sourceforge.net> was not working quite right. I tried to repair it and now it functions a little better. 1. With the help of user rayman, we discovered the Quilling data that needs to be copied with the Quilling clip. This appears to be Quilling data in the Sound file from offset 0x3200 to 0x3EFF. This block of data is all 0xFF in PS2 sound files and all 0x00 in most PS3 sound files. In PS3 sound files with Quillable Whistle, there appears to be "real" data in this block. I added a check box "[X] Quillable Whistle" to the Edit Clip window. This check box is enabled when you are replacing a clip from another sound file or when you are adding a clip from another sound file into an empty location. 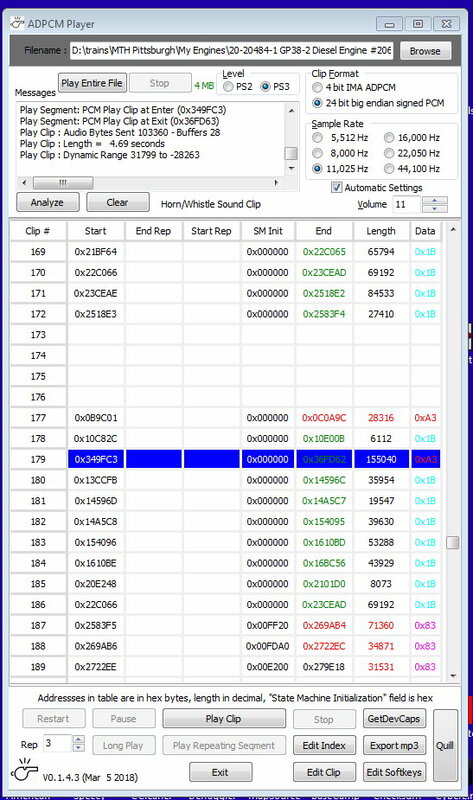 Note that it appears that the Quillable clips are all contained in clip 3 in the sound file though I don't know if that is always the case. If you check the check box, then when you press [Do It] to replace/add a clip, the necessary Quilling data is copied to the sound file along with the new clip. This will work for any clip number just in case the Quillable clips are at something other than clip 3. This operation is a copy of exactly 0xD00 bytes so the sound file neither grows nor shrinks as a result of copying this data. Note: v1.3.6 was not the complete story to copying the Quillable Whistle. Version 1.4.0 and later have a better implementation. 1. I added a new screen to let you play the sub-clips of the quillable whistle. The quillable whistle, usually clip 3, is a set of short clips that the engine plays in different sequences in response to the thumbwheel movement. To play each of these sub-clips, load and analyze a sound file, select clip 3, and press the [Quill] button. Then press [Analyze] on the Quilling Whistle Index window. ADPCM will display all of the sub-clips. You can double click on any one to play it. There can be up to 208 sub-clips. You should replace all of the whistle clips with the replacment clips otherwise you will have different sounding whistles in the engine. But that is up to you. Open ADPCM with the sound file that you want to add the quilling whistle. Edit the softkeys and check the [X] Proto Whistle SPW box. Now add clip 3 (the quilling whistle) from the Greenbrier into the empty clip 3 index position. Check the [X] Quilling Whistle check box before you press [DoIt]. I don't know for sure, but apparently, the quilling whistle has to be in clip 3. If clip 3 is not empty, this procedure probably won't work. Download the sound file into your engine. Delete the engine from the remote and Add it again. This will make the remote show the SPW softkey. Information Only - for those of you with some programming background, here is the problem with the Quillable whistle - the quilling data uses HARD CODED sound file addresses. It should have used relative address from the start of the clip, using the address in the clip index as a base. This means that if sound clip 3 gets moved from its original starting address, the HARD CODED addresses in the quilling data must be adjusted. This is what I added in v1.4.0. Remember that the sound category corresponds to the different volume controls available in the engine. When you press [Play Clip] for clip #152 (horn/whistle), ADPCM will always play clip 153 as the ending of the horn/whistle. This will also occur if you press [Export mp3]. When you press [Long Play] for clip 152, ADPCM will play the clip with the number of Repetitions set and then will play one of these three clips as the ending: the program will randomly choose clip 154, 155 or 156. This will also occur if you press [Shift][Export mp3]. As Rob Adelman describes it in his book "Model Railroading with MTH Electric Trains" : "You can vary the whistle/horn by pressing and holding the W/H button for 3 seconds or more. Doing so will cause different tone inflections in the ending of the whistle/horn sound ending depending on how long you hold the button down, producing a neat, varied effect." 1. Clarification: the popup menu from the clip index has a menu item "Minimize File Length". This is useful if you have uploaded a sound file from an engine. The resultant uploaded file sizes are always an integral multiple of 1 MB (that is, 1MB, 2MB or 4MB). The actual sounds rarely take up the entire file size. This menu item will chop off the unused ending of the file so that it will download into the engine much faster. I should also add that you don't have to do this to add new clips to the sound file. ADPCM automatically detects the filler at the end of the file and moves new sounds over top of the filler. 2. Fixed a problem that caused a crash when you edited a second clip index during one session. 1. Using ADPCM, click on the sound index you want to use, right click for the popup menu and select "Dump this clip to disk" -> "Dump Entire Clip to Disk". This will create a "*.ima" file on disk. The name of the file will be the sound file name followed by the clip number. This file is in IMA-ADPCM format. 4. You can edit the sound as necessary and then export it and prepare it for use by ADPCM. Follow the instructions above in the section "Replacing a clip with clip from another file"
Adding a SXS Crossing sound into a PS2 engine that did not originally have one. I am using 20-3232-1 as my example. Uses my ADCPM program and Audacity. Adding a Quillable Whistle (Proto Whistle) sound into a PS3 engine that did not originally have one. I am using 30-1660-1 as my example. Uses my ADCPM program and Audacity. Video recorded 23 Apr 2017. No, this is not something we brass hats do. Its something that most PS2 and PS3 engines can't do. Did you ever notice that no matter how quickly you press and release the horn button on the remote or with RTC, there is a minimum length of time that the horn blows? So, for example, it is almost impossible to sound a crossing signal sound manually that actually sounds like a real version would sound. That is because the shortest toot can you can blow is about 1.5 to 2 seconds long. Follow along my example using the 20-20484-1 GP38-2 Diesel Engine #2060. Clip 152 is 0.87 seconds long and clip 153 is 0.89 seconds long. Total is 1.76 seconds - this is the shortest toot you can manually get from the engine. I wanted a much shorter toot and I got it using Audacity to create the clip and ADPCM to insert the new toot into the sound file. 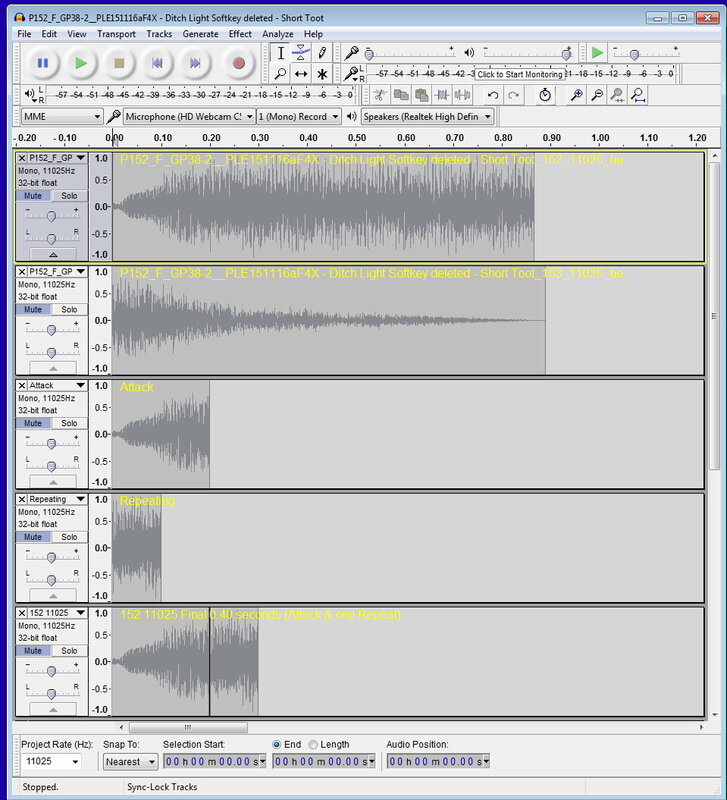 I used Audacity to create new tracks by cutting & pasting parts of the original 152 and 153 clips. The third track is the first 0.20 seconds of the original 152 clip. The fourth track is about 0.10 seconds cut out of the middle of the 152 clip. This chunk is what I call the repeating segment - the part of the clip that repeats over and over if you hold down the button for a longer time. The fifth track is track 3 followed by track 4. This will become the new clip 152 in the sound file. I exported this track to a file, converted it from little-endian to big-endian and then used ADPCM to replace the old clip 152. This clip is about 0.30 seconds long. The first track is clip 153 as dumped by the ADPCM program. The second track is the first 0.49 seconds of the original 153. Yes, I know, I cut off some of the decay of the toot but when I played it, I still sounded fine to me. This will become the new clip 153. I exported this clip to a file, converted it from little-endian to big-endian and then used ADPCM to replace the old clip 153. So the shortest toot possible now is the 0.30 seconds from the new clip 152 and the 0.49 seconds from the new 153 - for a short toot of 0.79 seconds. About half of the original. In the screen above, clips 152 and 153 are the two new (shorter) toot clips. A few words about the End Rep and Start Rep fields. When you hold down the horn button, the engine will repeat the Repeating Segment over and over untill you release the button. The Start Rep and End Rep fields define this part of the clip. When you replace the 152 clip, you must specify these two fields. You have to figure out the values for these fields that make the horn sound the best. I'm not sure that I did the best job possible here but the new horn sounds pretty good. For my particular case, with clip 152 loading at Start Address of 0x17AF57, I used 0x17D5C1 (+983410), for the End Rep Address and 0x19C93D (+663010) for the Start Rep Address. If you edit up your own short toots, your values will be different. I used the DCS Loader to load this sound file into my engine. Video recorded 6 Mar 2018. At the same time that I put in the shorter toot, I wanted to use part of clip 154 as a separate sound. Clip 154 is a long horn ending that plays the recognizable riff - "Shave and a haircut, two bits." In the screen shot below, the top track is clip 154 as exported from the sound file by the ADPCM program. The first part of the track is the ending sound for the long horn sound generated by clip 152. I took that track and, using Audacity, I clipped off that ending sound at the beginning of the track. I exported this track to a file, converted it from little-endian to big-endian and then used ADPCM to replace the old clip 179. This clip is about 5.40 seconds long. Why 179? The S01-S10 softkeys on the remote cause the engine to play the clips stored at indexes 177-186 in the sound file. Once this new sound file was installed in the engine, I could press the S03 softkey and the engine will get its shave and haircut. Here is the ADPCM screen after I successfully loaded in the new clip 179. The "Data" field is "A3" which associates this clip with the horn/whistle. That means if you adjust the horn/whistle volume, this clip will follow that adjustment. You can see in the "Messages" window, this new 179 clip is 4.69 seconds long. Video 7 on this page includes a demo of what this horn sounds like. Screen recording performed with CamStudio and with Icecream Screen Recorder.